Omega Red is a fictional character that appears in comic books published by Marvel Comics. 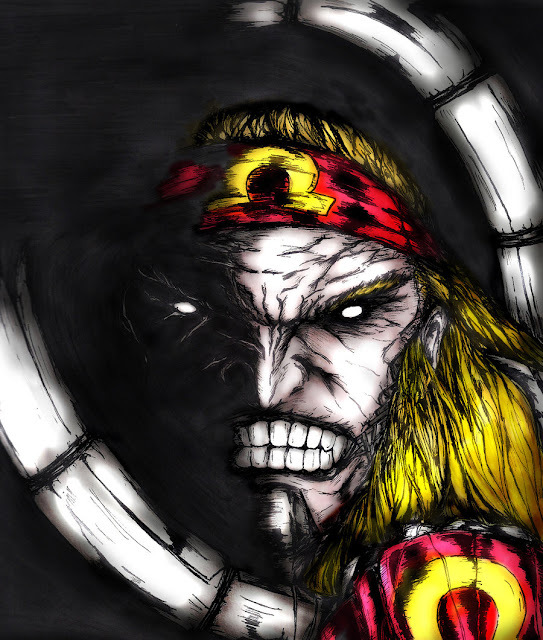 In 2009, Omega Red was ranked as IGN's 95th Greatest Comic Book Villain of All Time..More about Omega Red Character Review...keep reading !! Omega Red is a mutant with superhuman strength, speed, stamina, durability, agility, and reflexes, and the ability to secrete pheromones from his body typically referred to as Death Spores. The death spores result in the weakness or death of humans in his immediate vicinity. The severity of the effect is based on the endurance, health, and relative proximity of the victims. The spores are fatal to ordinary humans within seconds, though some superhumanly powered beings can withstand exposure to them for extended periods of time. 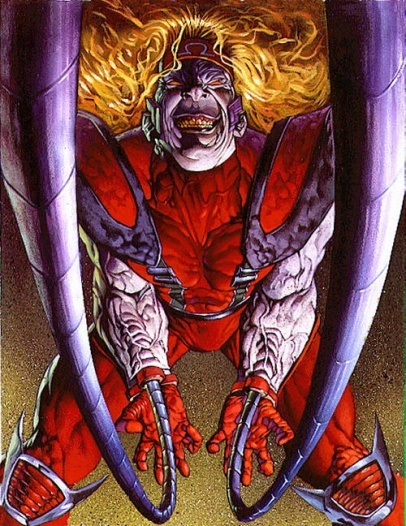 Implanted within Omega Red's arms are long retractable tendril-like coils made of carbonadium, an artificial alloy that is the former Soviet Union's attempt at creating true adamantium. Carbonadium is more malleable than adamantium and, while being vastly stronger than steel, is considerably less durable than adamantium. Carbonadium, however, is for all practical purposes virtually indestructible. Omega Red can cause the coils to shoot forward from openings in the undersides of his wrists in order to ensnare his victims. Omega Red is able to use the tentacles as highly effective offensive weapons, often brandishing them like whips during combat. The natural durability of the tentacles, combined with his physical strength, are sufficient to cause damage to most conventional materials. Omega Red also has superhuman levels of stamina sufficient to engage Wolverine in combat continuously for over eighteen hours with no signs of fatigue. His bodily tissues are harder and more resistant to certain types of injury than those of an ordinary human. While he is not invulnerable, his body can withstand great impact and blunt trauma forces that would result in severe injury or death in an ordinary human. However, his resistance to injury is considerably enhanced due to the red armor that he wears. 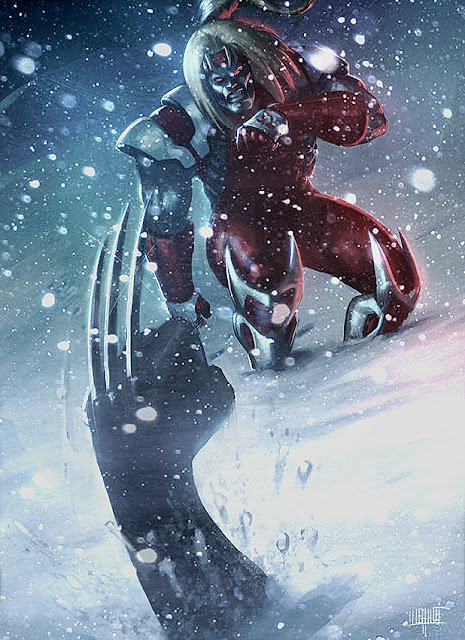 While it is unknown what the armor is composed of, it is sufficient to allow him to withstand powerful energy blasts from the likes of Chamber, and Wolverine's claws, without sustaining injury. Omega Red has the ability, and need, to drain the life force of victims with his pheromones in order to sustain his own. Omega Red can likewise ensnare his victims within his tentacles, and use the coils as a conduit for his lethal pheromones. Due to the mutant "death factor" and the presence of the carbonadium within his body, Omega Red must drain the life force of others on a regular basis in order to sustain his own physical health and remain active. Omega Red can use these absorbed energies to, temporarily, increase his body's healing capabilities to the point where he can fully heal from a punctured lung within a few minutes. Only a device known as the Carbonadium Synthesizer can stabilize his condition, as carbonadium is the only metal that can neutralize the "death factor," thereby stabilizing it within his body. Omega Red is an excellent hand-to-hand combatant and military tactician. He was trained in various forms of armed and unarmed combat by both the Soviet government and various organizations throughout the Japanese and Russian criminal underworlds. Highly intelligent, he has quickly become highly skilled in the management of criminal organizations. Omega Red's name can be seen in X2: X-Men United on the computer when Mystique hacks into Stryker's computer. Omega Red has appeared in the Hulk Vs segment "Hulk Vs Wolverine" voiced by Colin Murdock. He works with Weapon X (opposite of the comics) to capture Hulk so they can use him as their ultimate weapon. Like all members of Weapon X, he hates Wolverine, although he always gets annoyed by Deadpool. He is defeated by Wolverine and Hulk.